Where else can you find stunning mountain vistas, incredible lakes and rivers, affordable real estate and the hottest summers in Canada? 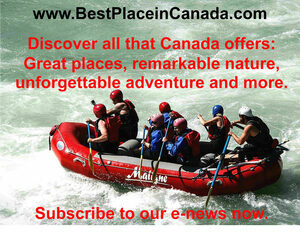 Lillooet is British Columbia’s hidden gem...and not only because it is the jade capital of Canada. The town is located between the eastern edge of the Coastal Mountain foothills and the western edge of the province's interior desert landscape. Steeped in First Nations (Canada’s aboriginal people) culture and rough and tumble gold rush history, Lillooet overlooks the Fraser River, the largest salmon spawning river in the world and the longest undammed river in North America. Lakes and smaller rivers form part of the Fraser River drainage system and the terrain varies from semi-arid desert on one side of the Fraser to rugged mountain and subalpine forest on the other. Lillooet’s abundant sunshine, dry winters, and hot summers are turning the area into viable wine country. 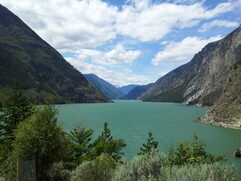 Numerous spots in Lillooet and along the highway offer beautiful views of the river canyon. Lillooet housing prices are uncharacteristically low for British Columbia and the community is arguably the most affordable within four hours of Vancouver and the Lower Mainland or the cities and towns of the Okanagan Valley. The population of Lillooet is 2,300 people. In 1860, Lillooet was the second largest community west of Chicago. Only San Francisco had more people. The Fraser River deposits over 18 million tonnes (20-million tons) of sand, silt and mud from the British Columbia’s interior, as a result of erosion, glaciation, rock-breaking frosts, rain freshets, and spring floods. Lillooet is frequently Canada’s hot spot in the summer, reaching temperatures in excess of 40° C (104° F). The regional economy is supported by agriculture, viticulture and forestry, as well as retail and commercial businesses serving a trading area of over 5,000 people. Opportunities abound for entrepreneurial people looking to start their own businesses with low overhead and low cost of living. Lillooet is a great choice if you want to be your own boss. Cultural and adventure tourism, niche restaurants and eclectic shops all present commercial potential in Lillooet. Commercial buildings downtown, as well as industrial properties on the edge of town, are available at competitive prices for purchase or leasing. The town is situated on two major highways and offers rail access. The District of Lillooet owns and operates a municipal aerodrome with a 1,216 metre ( 3,990 feet) runway and offering fuel sales, tie downs, pilot lounge and two trailer pad rentals. There is potential to expand the runway to 1,524 metres (5,000 feet). 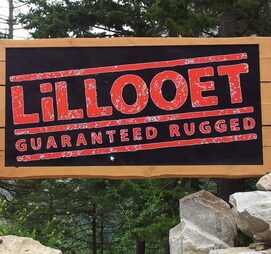 Lillooet’s slogan is “Guaranteed Rugged” – a testament to its wild and natural beauty. Fishing, hiking, camping, rock climbing, and mountain biking all begin on the edge of town. The roads around Lillooet offer some of the most stunning and memorable motorcycle trips in Canada. Lillooet is also fortunate to have a first-class recreational facility that houses an indoor swimming pool), ice rink, racquetball and squash courts, gymnasium, daycare, public library and meeting rooms. Lillooet has a rich history, beginning millennia ago with First Nations that continue to live in the region today. Archeologists have worked with Lillooet First Nations to excavate an extensive village of pit houses and food caches dating back approximately 2,000 years. Today, visitors can learn more about First Nations history through cultural experiences, including the spectacle of watching First Nations fishermen catch and dry salmon in a traditional manner. Eleven First Nations bands fish off the rocks of the Fraser River. First Nations pictographs (delicate rock paintings) are seen throughout Lillooet and surrounding area. In addition to a rich native culture, Lillooet is forever linked to the Gold Rush era and oddly enough, to camels that have been immortalized in the bridge that crosses the Fraser River. Lillooet’s international reputation for jade production is on display in many spots along Main Street, offering an enjoyable walk by a number of sculpted pieces. 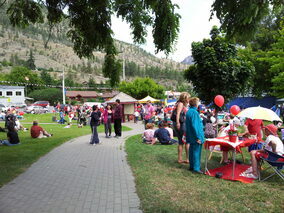 Lillooet offers many events and festivals throughout the year, including a Farmers’ Market, Garden Tours, the Apricot Tsaqwem Festival, the Sturgeon Fishing Derby, the Salmon in the Canyon Festival and music series at a historic downtown property.